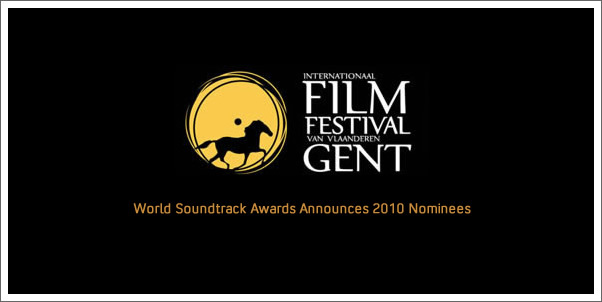 Ghent - The World Soundtrack Academy has announced the list of its nominees for the 2010 Awards to be presented in three categories: Film Composer of the Year, Best Original Score of the Year and Best Original Song Written Directly for a Film. The names of the winners will be announced at the World Soundtrack Awards 10th Anniversary Gala on Saturday, October 23, the closing night of the Ghent International Film Festival. Following the Awards presentations, 11 world class composers will be appearing live in concert including Oscar-winners Howard Shore (Lord Of The Rings trilogy), Elliot Goldenthal (Frida, Interview With A Vampire), Gabriel Yared (The English Patient), Gustavo Santaolalla (Babel, Brokeback Mountain), Stephen Warbeck (Shakespeare In Love) as well as Angelo Badalamenti (Twin Peaks), Craig Armstrong (Elizabeth: The Golden Age, Ray) Alberto Iglesias (The Kite Runner, Volver), Bruno Coulais (The Chorus), Frédéric Devreese (Un Soir, Un Train) and brilliant young composer Nico Muhly (The Reader). The World Soundtrack Academy was founded in 2001 by the Ghent International Film Festival to celebrate the role of music in film and honor film composers. The WSA Academy now has over 300 international members comprised of composers, film professionals, record label executives and other representatives of the film music business. At the end of August, the Academy Board will announce the 5 nominees for the category ‘Discovery of the Year 2010’. In addition to the Awards presented by the Academy, film music fans around the world can vote for the best soundtrack of the year (see www.worldsoundtrackacademy.com).